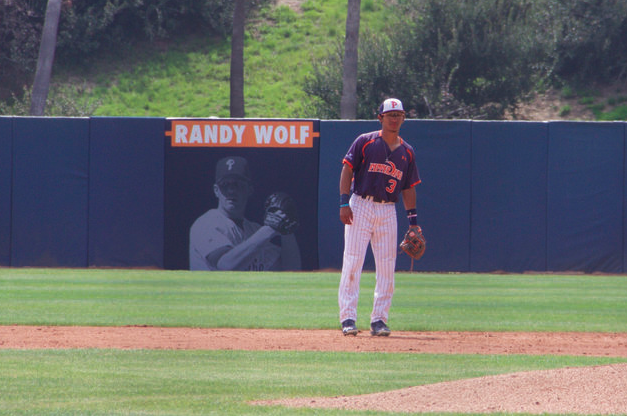 Pepperdine Baseball honored former pitcher Randy Wolf on Saturday, March 31 prior to the Waves’ 5-2 win over BYU. Pepperdine Athletic Director Dr. Steve Potts said the decision to honor Wolf was an easy one due to his success as a pitcher. 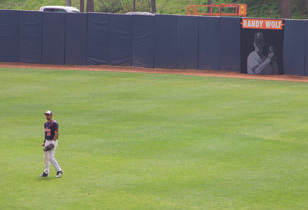 The program unveiled a mural with Wolf’s name and photo on the outfield wall of Eddy D. Field Stadium. Wolf also threw out the ceremonial first pitch and held an autograph and photo session with fans during the game. Wolf said it was a special honor and always enjoys being back in Malibu. Wolf, the Waves’ all-time leader in strikeouts and shutouts, pitched for Pepperdine from 1995-97 and compiled a 25-8 record with a 1.97 ERA. He struck out 328 batters in 315 innings, which ranks in the top 10 in school history in both categories (first in strikeouts, second in ERA). During his three-year tenure as a Wave, Pepperdine went 103-63-1, claiming the 1995 West Coast Conference championship and advancing to the NCAA West Regional. He also pitched for the United States National Team in 1995 and 1996, posting a 6-0 record in international play. Wolf said his favorite moment from Pepperdine was reaching the 1995 NCAA West Regional as a freshman. Following his time at Pepperdine, Wolf was selected by the Philadelphia Phillies in the second round of the 1997 MLB Draft. Wolf spent 16 seasons in the Majors between 1999 and 2015, pitching for the Phillies, Los Angeles Dodgers, San Diego Padres, Houston Astros, Milwaukee Brewers, Baltimore Orioles, Miami Marlins and Detroit Tigers. He made an all-star appearance for the National League in 2003 and has a career 133-125 record with a 4.24 ERA. Wolf said his time at Pepperdine prepared him for an extensive career in the major leagues. Wolf was inducted into the WCC Hall of Honor back in March. He was also selected to the WCC’s 40th Anniversary Team in 2006 and inducted into the Pepperdine Athletics Hall of Fame in 2010. Potts said the program plans to honor more former players as the year continues. “It’s great to have a program where you have guys like that, ones that you can honor,” Potts said. “We’re fortunate in so many of our sports that we have, and we have many great players that went on to have great professional careers. This is probably something we should’ve been doing a long time ago, but it’s certainly something we’d like to continue not only in baseball, but perhaps in other sports.